The First World War was an unprecedented catastrophe that killed millions and set the continent of Europe on the path to further calamity two decades later. But it didn’t come out of nowhere. With the centennial of the outbreak of hostilities coming up in 2014, Erik Sass will be looking back at the lead-up to the war, when seemingly minor moments of friction accumulated until the situation was ready to explode. He'll be covering those events 100 years after they occurred. This is the 97th installment in the series. The assassination of the Austrian Archduke Franz Ferdinand and his wife Sophie in Sarajevo on June 28, 1914 was the culmination of a conspiracy that began forming six months before. But conspiracies have a tendency to mutate or evolve, and this plot was no exception: In fact, it initially targeted a different person altogether. The man who set the ball rolling was Vladimir Gaćinović, well known in Serbian nationalist circles as the author of a pamphlet lionizing Bogdan Zerajic, who in 1910 tried unsuccessfully to assassinate General Varešanin, the Austrian governor of Bosnia-Herzegovina, then killed himself, becoming a martyr to the cause. Gaćinović was also a member of Mlada Bosna (Young Bosnia), a revolutionary group inside Bosnia, and Ujedinjenje Hi Smert (Unity or Death, also called Crna Ruka, the Black Hand), an ultranationalist cabal led by the chief of Serbian military intelligence, Dragutin Dimitrijević, codename Apis (above, left). 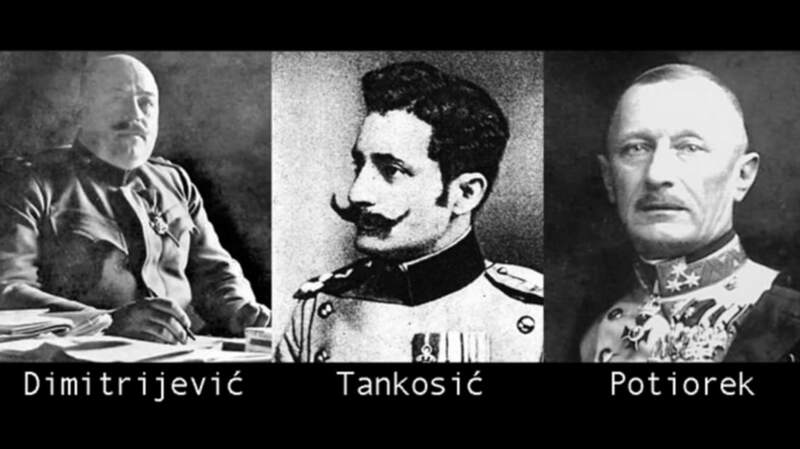 In autumn 1913, Dimitrijević’s right-hand man Major Vojislav Tankosić (above, center) instructed Gaćinović, who was then living in Lausanne, Switzerland, to convene a meeting of Mlada Bosna members to plot the assassination of a high-ranking Austrian official. At this stage it wasn’t quite clear who the target would be, and frankly it didn’t really matter; the most important thing was that the murder should inspire violent resistance by Slavic nationalists inside the Austro-Hungarian Empire, hopefully leading to a general uprising. Towards the end of December 1913, Gaćinović invited several members of Mlada Bosna to a secret meeting in Toulouse, France, in January 1914. Participants included Gaćinović himself; Mustafa Golubić, another member of the Black Hand who later became a Soviet agent in Yugoslavia in the interwar period; and Muhamed Mehmedbašić, a cabinetmaker from a minor Bosnian Muslim noble family which had fallen on hard times. According to Mehmedbašić, the plotters discussed a number of potential targets, including Franz Ferdinand, but finally agreed that the victim should be Oskar Potiorek (above, right), the Austrian governor of Bosnia-Herzegovina, who succeeded Varešanin in May 1911 and earned the hatred of Slavic nationalists by declaring a state of emergency in the restive province in May 1913. Mehmedbašić was supposed to carry out the assassination using a dagger dipped in poison provided by Gaćinović—but it didn’t take long for this plot to fizzle out. According to his own account, on the way back to Bosnia Mehmedbašić panicked and threw the dagger and poison away when Austrian police boarded the train and began searching the compartments (it later turned out they were looking for a thief). Still hoping to strike a blow against Austrian tyranny, back in Sarajevo Mehmedbašić got in touch with his friend Danilo Ilić, a Bosnian schoolteacher and journalist who volunteered in the Serbian army during the Second Balkan War in 1913, joined the Black Hand while living in Belgrade, and later returned to Sarajevo to work with Mlada Bosna. Ilić was in contact with Gaćinović in Switzerland and was also best friends with a young Bosnian Serb nationalist named Gavrilo Princip, who’d been drifting back and forth between Sarajevo and Belgrade—where he was supposedly attending high school but actually spent most of his time in grimy cafes frequented by radical nationalists and anarchists. As a matter of fact, Ilić and Princip had discussed their own plan to assassinate Potiorek in 1912, but this also came to nothing. Lurking in the background of these overlapping, often half-baked plots was always the puppet master Apis, pulling strings through his Black Hand henchmen including Tankosić and another man, Milan Ciganović—a Bosnian Serb who’d served as a paramilitary commander in the Balkan Wars and now worked for the Serbian state railroad (as it happened Ciganović and Princip came from the same district in Bosnia and briefly lived together in the same house in Belgrade in 1912). Not long after the Toulouse meeting, in February or March, 1914, Apis learned that Archduke Franz Ferdinand was planning to attend military maneuvers in Bosnia in June 1914, and would even have the audacity to visit Sarajevo on the anniversary of the Battle of Kosovo in 1389—a key event in Serbian history, symbolizing Serbia’s long history of foreign oppression. Now a new plot began to take shape. As 1913 drew to a close, ordinary Europeans could look forward with relief to the New Year: after a series of crises Europe finally seemed to be recovering its equilibrium, and there was every reason to hope for lasting peace. But all the apparent successes of diplomacy, negotiation, and compromise were in fact setting the stage for disaster. The Year 1913 had been born in crisis, with Austria-Hungary and Russia facing off in the wake of the First Balkan War, in which Bulgaria and Serbia conquered the Ottoman Empire’s European territories. Austria-Hungary’s Foreign Minister Count Berchtold correctly viewed Serbia as a magnet for the nationalist aspirations of the Dual Monarchy’s Southern Slavs, and was determined to force the Serbs to give up their conquests in Albania, thus denying Serbia access to the sea (which would have bolstered Serbian prestige). This put Austria-Hungary on a collision course with Serbia’s Slavic patron Russia, where Foreign Minister Sergei Sazonov was under pressure from “Pan-Slav” ideologues to support their ethnic kinsmen in the Balkans. This crisis was eventually resolved by the Hohenlohe Mission, a personal appeal from Austro-Hungarian Emperor Franz Josef to Russia’s Tsar Nicholas II that paved the way for a compromise at the Conference of London, including the creation of an independent Albania. But this wasn’t the end of the Balkan crises—not even close. While Serbian forces began withdrawing from Albania, in April 1913 Serbia’s sidekick Montenegro captured Scutari, an important city that had also been granted to Albania at the Conference of London. This second crisis was resolved when Europe’s Great Powers offered Montenegro’s King Nikolai the choice of a carrot (a sweetheart loan from Britain and France) or a stick (war with Austria-Hungary); Nikolai wisely chose the carrot and the Montenegrins withdrew from Scutari. And still the turmoil continued with the Second Balkan War from June to August 1913, when Bulgaria attacked Serbia and Greece over the spoils of the First Balkan War—then swiftly reaped the whirlwind as Romania and the Ottoman Empire piled on from the rear. Defeated on all fronts, Bulgaria turned to Russia for protection, but Sazonov, indecisive as ever, dithered, delayed and finally ended up cutting the Bulgarians loose in favor of the Serbians and Romanians, leaving the Bulgarians understandably embittered—and Serbia as Russia’s only remaining ally in the Balkans. This meant Russia would have to back up Serbia in future crises unconditionally, or risk losing all its influence in the region. The final Balkan crisis of the year came about in September, when ethnic Albanians in the southern Serbian territory of Kosovo rebelled and the Serbs responded by invading Albania proper, threatening to undo all Austria-Hungary’s recent efforts to create the new nation. Ultimately the Serbs backed down in the face of a unilateral threat from Austria-Hungary—another alarming development, as it convinced the Austrians they could go it alone in the Balkans, without having to consult the other Great Powers. Indeed, this was probably the closest Europe came to war during the past year: By autumn 1913, the hawks in Vienna, led by chief of staff Conrad von Hötzendorf, had persuaded Austrian Foreign Minister Count Berchtold (and Germany’s Kaiser Wilhelm II) that war was the only way to deal with the obstreperous Serbs. Ironically the only person standing in their way was the Archduke Franz Ferdinand, who warned that an attack on Serbia would bring war with Russia. If the Archduke were somehow removed from the scene, the hawks would be in the ascendant.